The ‘Battle of the Little Bighorn’ was one of the most famous battles of the Indian Wars. In Native American terms, it was known as the ‘Battle of the Greasy Grass’, while it has been more famously known among Whites as ‘Custer’s Last Stand’. 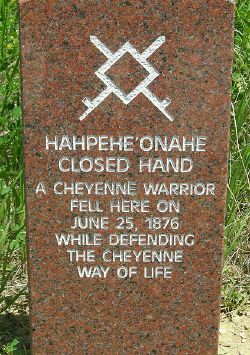 The most famous action of the Indian Wars, it was a remarkable victory for the Lakota and Northern Cheyenne. 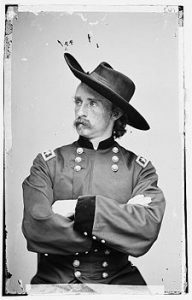 A sizeable force of U.S. cavalry commanded by Lieutenant Colonel George Armstrong Custer was defeated; Custer himself was killed in the engagement along with two of his brothers. Col. John Gibbon’s column of six companies, numbering about 450 men (elements of the 2nd Cavalry and 7th Infantry) marched east from Fort Ellis in western Montana, patrolling the Yellowstone River to the mouth of the Bighorn. Brig. Gen. George Crook’s column of ten companies of approximately 1,000 men (elements of the 2nd and 3nd Cavalry and 4th and 9th Infantry) moved north from Fort Fetterman, Wyoming, marching toward the Powder River area. Brig. Gen. Alfred Terry’s command, which included in excess of 1,000 men (7th Cavalry and elements of the 6th, 17th, and 20th Infantry) moved from Fort Abraham Lincoln (North Dakota) to the mouth of Powder River. Crook’s troops encountered a large band of Sioux and Cheyenne under Crazy Horse, Sitting Bull, and other leaders on the Rosebud on June 17th. The indecisive battle left them in need of reinforcements, so they retreated to the Tongue River to await supplies. While the Terry/Gibbon column was marching toward the mouth of the Little Bighorn, on the evening of June 24th, Custer’s scouts arrived at an overlook known as the Crow’s Nest, 14 miles east of the Little Bighorn River. At sunrise the following day, they reported to him they could see signs of the Indian village roughly 15 miles in the distance. Custer’s initial plan had been a surprise attack on the village the morning of June 26, but a report came to him that several hostile Indians had discovered the trail left by his troops. Assuming their presence had been exposed, Custer decided to attack the village without further delay. Unbeknown to him, this group of Indians were actually leaving the encampment on the Big Horn and did not alert the village. “We could see the smoke of their camp fires as they cooked breakfast. We scouts thought there were too many Indians for Custer to fight.” White Man Runs Him, Custer’s Crow Scout. The unusually large village gathered along the banks of the Little Bighorn included Lakota, Northern Cheyenne and a small number of Arapaho. The size of the village is unknown, though is estimated to have been 950 lodges, with between 900 to 1,800 warriors. Custer’s overriding concern was that the Indians would break up and scatter in different directions. The command began its approach to the village at noon and prepared to attack in full daylight. Custer and his men—who were separated from their main body of troops—were all killed by the far more numerous Indians who had the tactical advantage. Terry and Gibbon did not reach the scene of Custer’s last stand until the morning of June 27th. 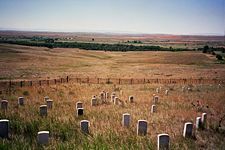 The 7th Cavalry’s total losses in this action (including Custer’s detachment) were: 12 officers, 247 enlisted men, five civilians, and three Indian scouts killed; two officers and 51 enlisted men wounded. 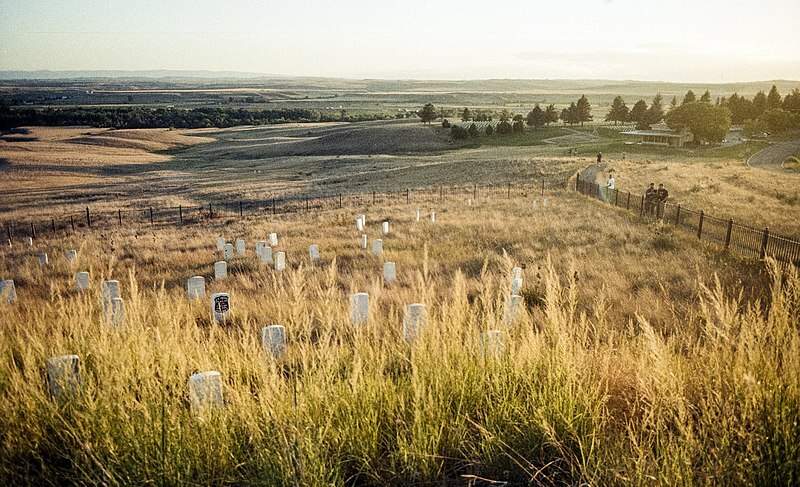 The site of the Battle of the Little Bighorn was first preserved as a national cemetery by the Secretary of War on January 29, 1879, three years after the battle. 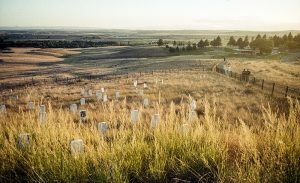 Christened “National Cemetery of Custer’s Battlefield Reservation,” it was intended to protect graves of the 7th Cavalry troopers buried there. Designating it as a National Cemetery would allow burials of soldiers from other campaigns and wars to be interred there as well. 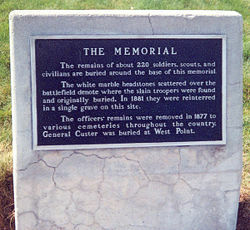 Following the recovery of Custer’s body, he was given a funeral with full military honors and buried on this battlefield. His body was re-interred at the West Point Cemetery on October 10, 1877, prior to the official establishment of the Little Bighorn Cemetery. Lieutenant Charles F. Roe and the 2nd Cavalry built the granite memorial in July 1881 that stands today on the top of Last Stand Hill. They also reinterred soldiers’ remains near the new memorial, but left stakes in the ground to mark where they had fallen. In 1890 these stakes were replaced with white marble markers. In 1940, jurisdiction of the battlefield was transferred to the National Park Service. It was redesignated “Custer Battlefield National Monument” in 1946, and listed on the National Register of Historic Places on October 15, 1966. These earliest memorials and designations honored only the U.S. Army’s dead. “The time has come to give equal honor to the Indian people who’ve been denied that for so long” -U.S. Senator Ben Nighthorse Campbell, Northern Cheyenne. “We want a place where the Native descendants can feel welcome and believe one’s people had done a courageous and good thing.” Arthur Amiotte, Oglala Lakota. 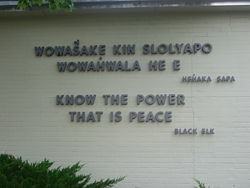 On June 25, 2003, the Indian Memorial Center was dedicated. The visitors center contains a small museum and a bookstore. 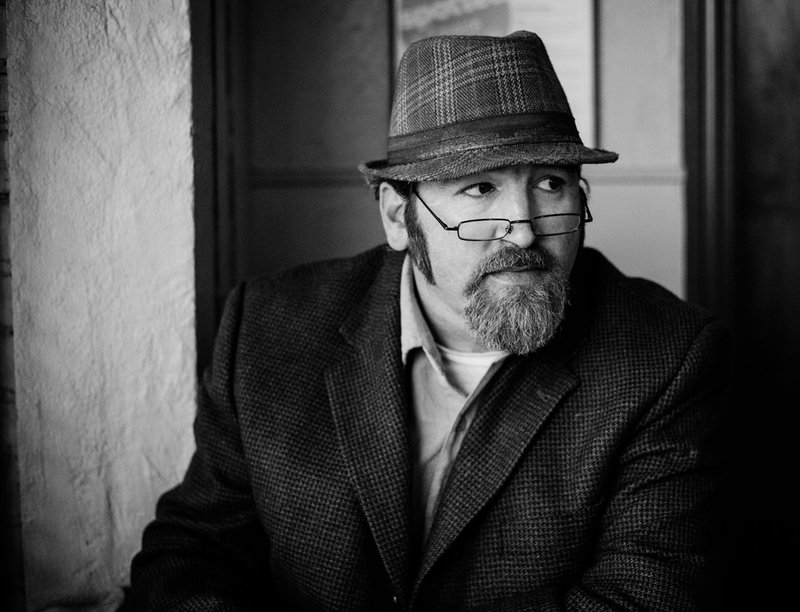 The design was determined through consultations between the National Park Service and tribal members who are historically connected to the events that occurred on the surrounding land. The office of the park historian in the historic stone house (original superintendent’s headquarters) houses the White Swan Memorial Library. 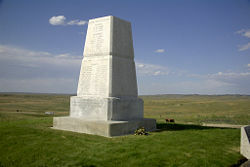 It contains the most comprehensive collection of research materials available on the Battle of the Little Bighorn, as well as other related historical events. “If this memorial is to serve its total purpose, it must not only be a tribute to the dead; it must contain a message for the living…power through unity.” -Enos Poor Bear, Sr., Oglala Lakota Elder. Chester L. Brooks, Theodore Roosevelt and the Dakota Badlands (U.S. G.P.O, 1958). Dee Brown, Bury My Heart at Wounded Knee: An Indian History of the American West (Owl Books: Henry Holt, 1970), 273. Bob Reece The Story of the Indian Memorial Friends Of The Little Bighorn Battlefield. Retrieved November 6, 2018. John Gray, Custer’s Last Campaign (Lincoln, NE: University of Nebraska Press, 1991. Father and Son united for Little Bighorn National Monument Lakota Country Times, June 17, 2009. Retrieved November 6, 2018. Donovan, Jim. A terrible glory: Custer and the Little Bighorn—the last great battle of the American West. New York: Little, Brown and Co., 2008. Fox, Richard A. Archaeology, history, and Custer’s last battle: the Little Big Horn reexamined. Norman: University of Oklahoma Press, 1993. Gray, John. Custer’s Last Campaign. Lincoln, NE: University of Nebraska Press, 1991. This entry was posted in History, Native Americans, United States. Bookmark the permalink.